The May Drive Parkland is a recreation area for the entire family, on the western side of Kings Park and easily accessed via Saw Avenue or Poole Avenue. The playground is particularly suitable for children over seven years with a 75-m long elevated walkway, island fort, large-scale replicas of extinct Australian mega fauna and an interactive water misting forest. There are so many things to do in May Drive Parkland! View or download a visitor map of the May Drive Parkland. Discover ancient wonders and 'Evolution Through Time' in May Drive Parkland. Choose the perfect May Drive Parkland venue for your function or event. Zamia Cafe enjoys a casual but striking setting with excellent food and service. 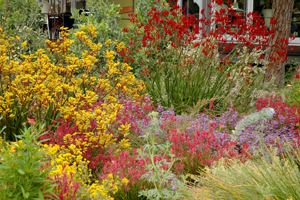 The Backyard Botanicals Garden showcases native plants for your own backyard.